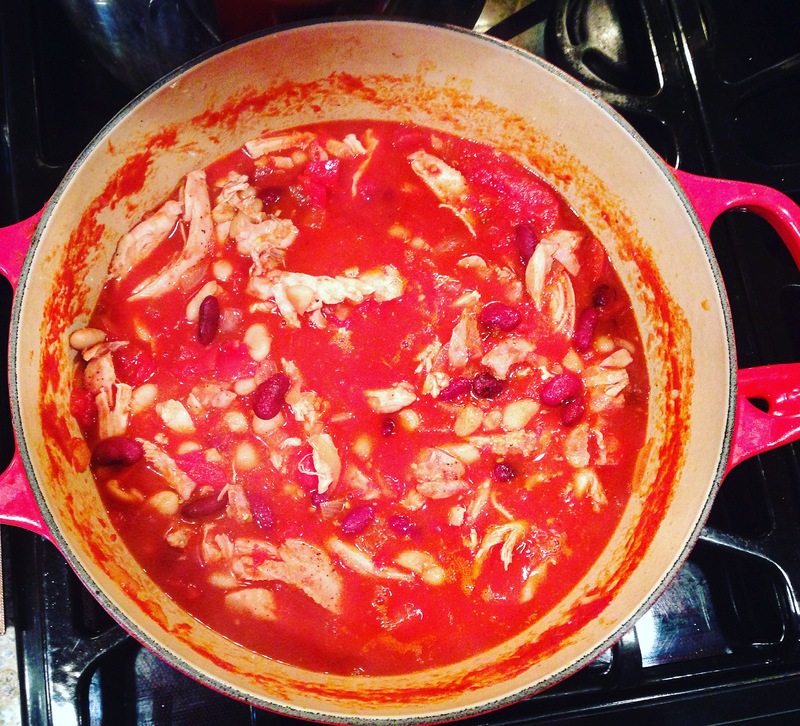 I continued to test the recipes from Gwyneth Paltrow’s cookbook It’s All Good this week, landing on the Chicken & White Bean Chili recipe because it seemed simple, approachable, and really tasty. I make a lot of soups and chilis once the weather starts to cool down. I usually double the recipe and put some in the freezer (lay flat in a freezer baggie) for a night when I’m too busy or lazy to cook. Whenever I make a soup or chili recipe, I tend to double the vegetables called for. It’s such an easy way to get more vitamins, antioxidants and fiber into yours and your family’s tummies. Add a can of kidney beans to the can of white beans called for. Use chicken thighs instead of breasts (I find them less dry and more flavorful). Use a teaspoon of Better Than Bouillon (the vegetable flavor). The recipe calls for the normal chili spices plus salt and pepper. I found when I tasted the chili it was a bit bland. Better Than Bouillon is a favorite of mine. I usually by the organic version and love that I don’t have to keep cans of chicken stock around in my pantry. It stays good forever and, unlike a half-used container of chicken stock, won’t make you feel guilty every time you see it in the fridge. Add some of the chicken juice from cooking into the pot with the simmering beans and vegetables. It adds nutrients from the chicken, some depth to the mouth feel (I really hate that term, can we come up with something else collectively? Comment below with any suggestions!) and adds some yummy chicken flavor. Rub chicken with about 1 Tablespoon of olive oil, and season with salt and pepper. Roast for about 25 minutes at 425 degrees, until just cooked through. 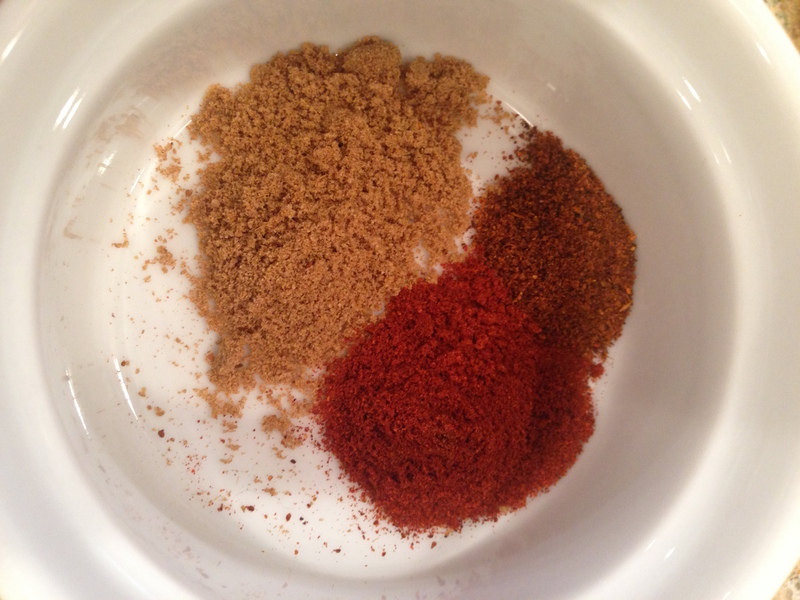 Measure the spices and combine in a small bowl to add during the next step. Meanwhile, heat 2 Tablespoons of olive oil in a stock pot on medium and sauté the onions, bell pepper, garlic, cumin, chili powder, paprika and a large pinch of salt. Cook, stirring occasionally, until veggies are softened, about 10 minutes. 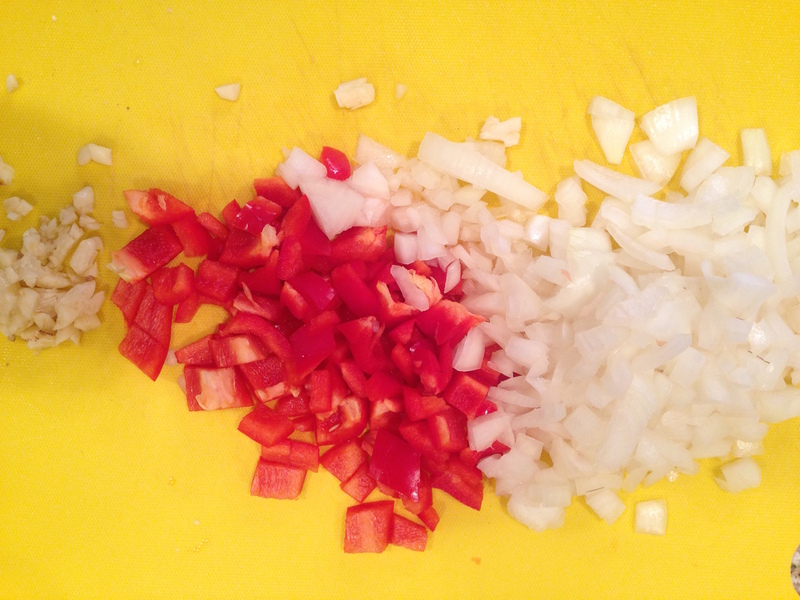 Garlic, red bell pepper and onion waiting for to be sautéed. Add tomatoes and another pinch of salt and turn up the heat. Bring to a boil and then reduce heat to simmer for about 30 minutes. Break up tomatoes with a spoon. Add beans and chicken to the pot (use bouillon now if you wish). Add about 1/3 cup water or more depending on how thick you want your soup. Simmer another 15 or 20 minutes before tasting to determine the spices or salt and pepper you want to add. My husband said the chili was “good, but not like oh my God I absolutely love this chili!”. He thought it needed a bit more chili powder and cumin to make it a true chili flavor and tasted more like a stew than a chili. My 10 year old daughter told me she likes my ground beef chili more. That being said, I really thought it was a solid recipe that I would go back to again if I wanted a variation from my ground beef chili that I usually make. Enjoy! I can’t wait to hear what you think!